name "Marilyn Monroe" that year. I plan to eventually read the entire autobiography of Arthur Miller, "Timebends" - after all why wouldn't the life of a leading 20th century playwright be of interest to me? And a playwright who wrote one of the few plays from the 20th century I really admire, DEATH OF A SALESMAN. But for now I'm reading for information about Marilyn Monroe. It's odd what Miller leaves out - I don't think he describes their wedding at all, just the car crash that resulted when paparazzi got wind of the wedding. 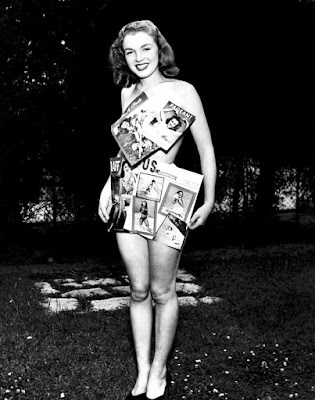 And as I mentioned he doesn't discuss his feelings when he heard Monroe married DiMaggio - or even mention DiMaggio at all except to note that the entertainment press felt that the Yankee Clipper was the perfect mate for Monroe. Aunt Grace did not bring me back to live with her (after her two-year stay in an orphanage). She took me to Van Nuys, a very poor neighborhood on the outskirts of Los Angeles. I was to live there with her aunt, a sixty-two-year-old spinster. Her home was a rundown bungalow, and the people in the neighborhood were mostly poor and on relief. But I'll never forget my living there with Miss Ana Lower. She became my aunt Ana. This woman became the greatest influence in my life. The love I have today for the simple and beautiful things in life are because of her teachings, bless her. She was one of the few persons that I really loved with such a deep love that I could only have for someone so good, so kind, and so full of love for me. One of the many reasons I loved her so much was her philosophy, her understanding of what really mattered in life. You know, like the time when I was going to Emerson Junior High and one of the girls in my class mad fun of a dress I was searing. I don't know why kids do things like that. It really hurts so. Well, I ran home crying as though my heart would break. My loving aunt Ana was so comforting. She just held me in her arms and rocked me to and fro like a baby and said, "It doesn't make any difference if other children make fun of you, dear - it's what you really are that counts. Just keep being yourself, honey. That's all that really matters." She was quite a person. She didn't believe in sickness, disease or death. She didn't believe in a person being a failure, either. She did believe the mind could achieve anything it wished to achieve. One evening as we sat staring down at the city, she said, apropos of nothing in particular, that when she was fourteen or fifteen her elderly "aunt" Ana, a Christian Scientist who was the one intelligent and kind woman she had known, took ill and died; loving her, Ana had been for a while an impromptu guardian, and Marilyn had come to rely on her. She had not been living with Ana for some time, but the shock of her death was terrible "I went and lay down in her bed the day after she died... just lay there for a couple of hours on her pillow. Then I went to the cemetery and these men were digging a grave and they had a ladder into it, and I asked if I could get down there and they said sure, and I went down and lay on the ground and looked up at the sky from there. It's quite a view, and the ground is cold under your back. The men started to try to fool around, but I climbed out before they could catch me. But they were nice and kidded me. And then I went away. Miller got her age wrong though. Lower died in March 1948 - Monroe was twenty-one - quite a bit older than fifteen. Miller could have easily had somebody research this but I guess he wasn't that interested in the details of Monroe's life. When I was living with Aunt Ana, since Mom was in the hospital, I would go shopping with her. We were all always looking for bargains, looking to save what little money Aunt Ana had. I remember one day we were standing on a long line where they were selling day-old stale bread. For a quarter you could buy enough of the stale bread to last a week. By the time Ana Lower died Monroe had already appeared in her first-released movie "Dangerous Years" - it's nice to know she got to see her predictions had come true before she died.